The Seventh Heaven Cocktail is a quick, simple, and summery gin sour. The formula—gin, citrus juice, and Maraschino—will be familiar as the basis of the Aviation in its late 20th-century incarnation—the one without crème de violette. Seventh Heaven uses grapefruit juice instead of the Aviation’s more tart lemon, resulting in a slightly softer cocktail. Shake with ice until cold; strain into a well-chilled cocktail glass. Garnish with a sprig of fresh mint. Many recipes specify just “gin,” or “London Dry Gin,” but I’ve found that Old Tom raises the bar a little on this drink. Beefeaters or Bombay Dry will work, but the Old Tom is a little sweeter and lighter than the standard juniper-forward London Drys. Hayman’s is the brand available in my market, and seems to blend well with the maraschino and grapefruit. The fresh mint garnish is a nice touch; the combination of grapefruit and mint provides a very summery and pleasant nose to the glass. Some recipes, especially older ones, have very small proportions of grapefruit juice; grapefruit is a relatively light citrus, and can easily be buried by the Maraschino. The 4:1:1 ratio listed here works quite nicely as a starting point; as with all juices, you’ll want to adjust with the seasons, and with your grapefruit supply. It is interesting to note that using grapefruit rather than lemon makes this a much softer sour than the lemon-based Aviation. There isn’t much history to be found on this drink. As for the name “Seventh Heaven,” the obvious similarity of this drink’s formula to the Aviation recipe suggests the name is a simple inflation of the aviation theme and the notion of “flying higher,” perhaps leaving worldly troubles behind—at least while you have that delightful gin sour in your hand. Pure speculation, but that’s my story, and I’m sticking with it. “The Seventh Heaven Cocktail” at cold-glass.com : All text and photos © 2011 Douglas M. Ford. All rights reserved. 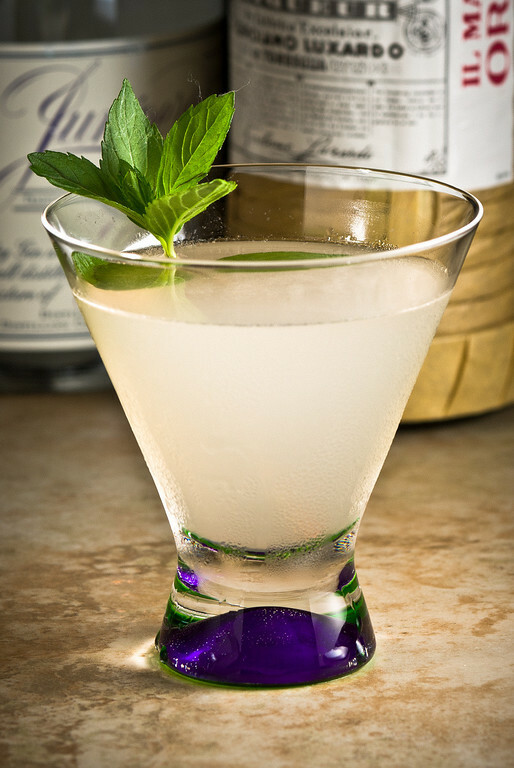 Substitute white rum for gin, and lime for lemon and ‘presto’ – Hemingway Daiquiri. Judging by how good the Hemingway Daiquiri is, I’d say this one will be a winner as long as the gin is not too juniper heavy. “…not too juniper heavy,” that’s an astute observation. The drink took on a much more pleasant character when my experiments turned from London Dries to Old Tom. That rum substitution leans toward La Floridita, too. Hmm…. future post.